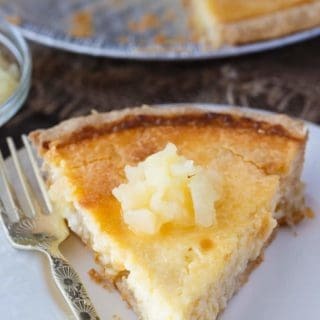 I love the creamy tropical flavour of this Pineapple Pie! If only I could transport myself to some warm beach with each bite. Now that would be something! Since I’m stuck here in the snow, this pie will have to do. It uses a pre-made frozen crust to save on time. 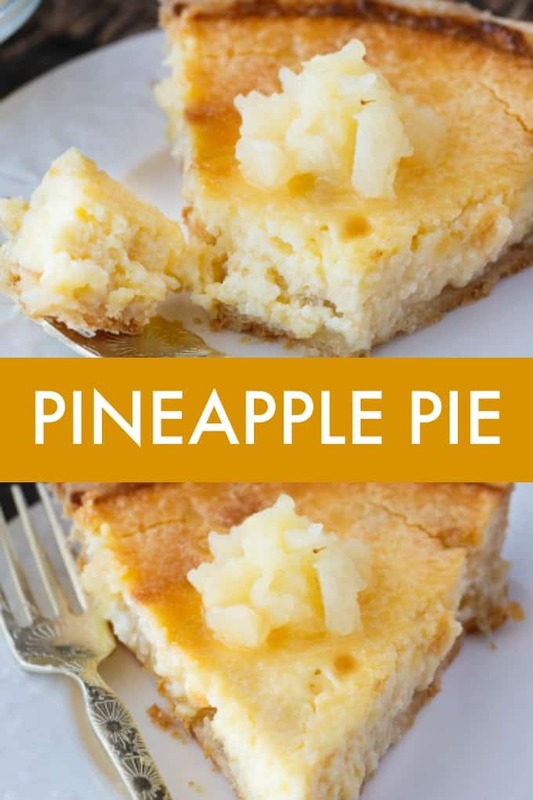 The bottom layer is sweet pineapple followed by a creamy, smooth cheesecake-like topping. It’s so good! My friend, Becky, came over while I was making a few recipes and she said this dessert was her favourite of the bunch. I let her take the leftover pie home with her. Aren’t I nice friend? Her boyfriend always texts me and asks if I’m cooking and can I bring him food. I usually cook for my blog about once a week and will try to bring leftovers over to their place if I can. It’s just Bridget and I home now so we can’t eat all the food ourselves. I don’t often bake with pineapple, but that will have to change. Use canned crushed pineapple versus trying to cut up a whole pineapple. I like easy and the canned stuff is much simpler to deal with! It’s a very straightforward pie to make. 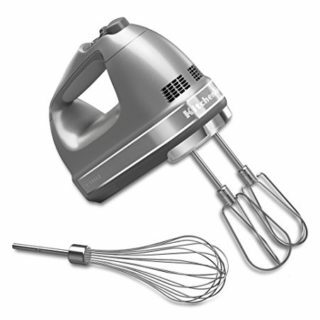 Get a large bowl and beat together cream cheese, 1/2 cup sugar, salt, eggs, milk and vanilla extract with an electric mixer. Set aside. To make the second layer, stir together cornstarch, 1/2 cup sugar and crushed pineapple in a small saucepan. Bring to a boil and let it boil for 2 minutes. Be sure to stir constantly. Let the mixture cool a few minutes and then pour into your pie shell. Pour the cream cheese mixture on top of the pineapple mixture. Bake for 10 minutes at 400F and then reduce the temperature to 325F and bake an additional 50 to 55 minutes, or until center is set. Let cool before cutting into slices. This pie would be a fabulous addition to your Easter dinner table! Try something different this year. I’ve brought Pineapple Pie to family dinners and it’s always received rave reviews. Everyone asks me for the recipe. Though we love the traditional pies like Pumpkin Pie, it’s a nice change. Want more pie? Try these delicious recipes. Sugar Pie: A vintage recipe that is perfectly sweet and decadent! Bonus points for it being super easy to make, too. Strawberry Cream Pie: Tastes like a dream! This easy summer pie is creamy, sweet and refreshing. Impossible Pie: The easiest pie you will ever bake! It magically forms its own crust plus two delicious layers while baking. Coconut Pie: Good old-fashioned pie like grandma used to make. This mouthwatering dessert will melt in your mouth and be a hit with your family. Do you think you’d enjoy this Pineapple Pie? Creamy, smooth and tropical! This pie is easy to prepare and guaranteed to be loved by all. In a large bowl, beat together cream cheese, 1/2 cup sugar, salt, eggs, milk and vanilla extract. Set aside. In a small saucepan, stir together cornstarch, 1/2 cup sugar and crushed pineapple. 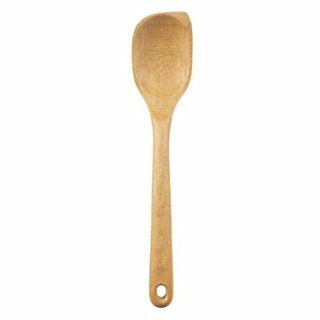 Bring to a boil and boil for 2 minutes, stirring constantly. Let cool a few minutes and then pour into pie shell. Pour cream cheese mixture on top of pineapple mixture. Bake for 10 minutes then reduce heat to 325F and bake an additional 50 to 55 minutes, or until center is set. I’m trying to figure out how may ozs of cream cheese. I read that 8 oz block of cream cheese has 227 grams. Would that be enough? I never had pineapple pie before. This looks and sounds delicious. I love pineapple and I love pie. But, I’ve never had pineapple pie before. Hmmm, must remedy that soon with this recipe. Thank you! This looks truly spring like and delectable! Yum, I must make this recipe! Waste of time/ ingredients in my opinion.Took a bite and not much flavor. Oh my goodness, this looks heavenly! Yum! Pinned & Shared! Thank you for sharing on Merry Monday! Hope to see ya next week! YUM!!!!! I love anything pineapple, I am totally trying this for Easter!! Thanks for sharing at #HomeMattersParty! P.S. How do you get your amazon links to line up so nicely at the bottom of your post?! Thank you! It’s Amazon Native Ads. This is really interesting. My grandmother made pineapple pie, but doesn’t put the cream cheese or egg in it. It’s just the pineapple with sugar and cornstarch, cook that in a pan, pour into pie shell, brush with milk and sprinkle on sugar and bake. So it comes out more of a regular fruit pie filling instead of a custard type filling. 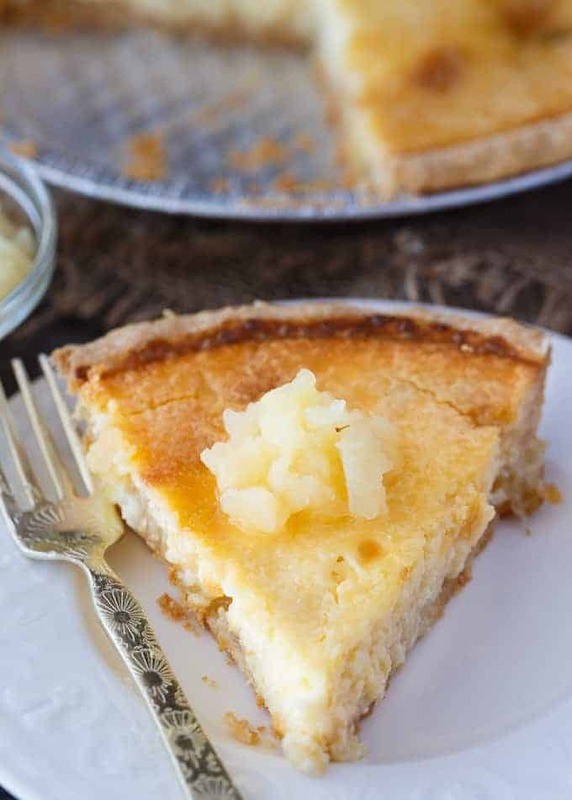 I’ll have to give this one a try too and maybe I’ll end up with two types of pineapple pie! When I serve mine at events it’s rare for anyone to have heard of it. Wonderful recipe!, do you blind bake pie she’ll to start with? Cannot wait to make this, I am huge lover of pineapple. No, I didn’t blind bake it. Hope you like it! I have made many hand pies with pieapple filling but I drain more of the juice off and while it simmers I mix the juice with cornstarch in it and slowly pour it into the fruit till of desired thickness. Where can I read the reviews that were from people who tried the recipe?